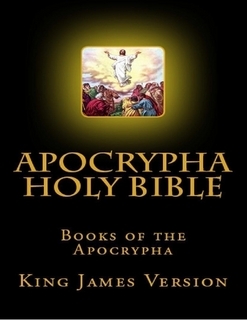 Apocrypha Holy Bible, Books of the Apocrypha: King James Version, Easy Verse reference Edition. This book contains the books of the Apocrypha, King James Version: 1 and 2 Esdras, Tobit, Judith, Adds to Esther, Wisdom, Baruch and Jeremiah, Prayer of Azariah, Susanna, Bel and the Dragon, Prayer of Manasses, 1 and 2 Maccabees.The biblical apocrypha (from the Greek word meaning hidden) are books published in a separate section of some editions of the Bible despite not necessarily being considered part of the canon. For this reason they are typically printed in a third section of the Bible apart from the Old and New Testaments. In many editions they are omitted entirely.